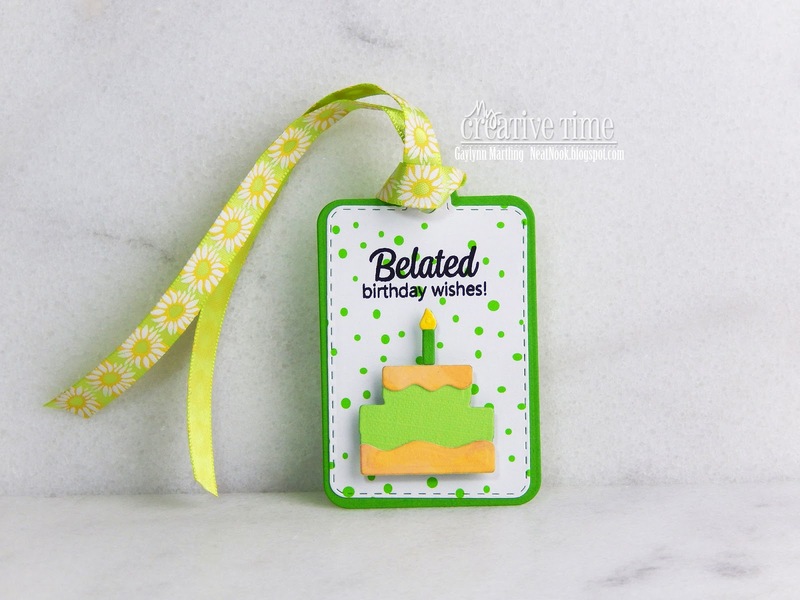 Hello, Gaylynn here with a cake shaped birthday gift tag or wine tag for the My Creative Time Anything Goes inspiration projects. Here is a festive shaped gift tag, decorated and ready to attach to a gift. The cake die set makes it easy to add decorative paper accents and provides space for a sentiment. I used My Mind's Eye paper for accents. To make it a tag, I added a hole punch on the edge with ribbon. Here is another look with the tag on a gift bag. Be sure to stop by Miss Emma's My Creative Time blog for more Anything Goes project inspiration. Today, this trendy word art watercolor card is up on the Unity blog as part of my Watercolor Wednesday series there. For this card, I used distress ink watercolor for the letter background. I made a quick video tutorial for the word art watercolor technique. 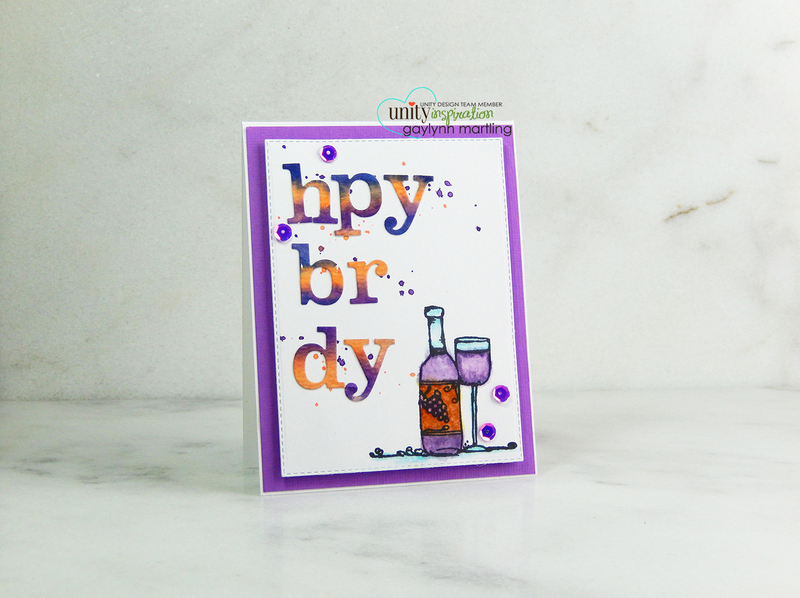 Supplies: Unity Stamp Co. Let's Uncork by Angie Blom and Ariel Collection sequins; Ranger watercolor paper, distress ink and distress markers; Gina K. Designs ink and My Creative Time dies. To read the entire article and details for this card, visit the Unity blog. Sweet support or sympathy card and tutorial. Sometimes it is hard to find words for loss, support or encouragement. This is a sweet card to show that you care. Sentiment: I am here for you. This sweet girl is by Phyllis Harris and she is colored with Copic markers and then die-cut. The background was made from using a die-cut as a stencil. It is super easy to do and stretches your dies for a different look. I made a quick video showing how this card came together. Link Up: Simon Says Wednesday Challenge ~ Use more than one stamp. If you see particular cards, tags etc. that you would like to purchase, feel free to comment or contact me with the name or item number, to see if it is still available. I have some cards for sale on my website. However, you will see the most recent ones here on my blog or on my facebook page. Supplies: Unity Stamp Co. Feeling Sad, Feeling Sorry; My Creative Time and Sizzix Tim Holtz dies, Copic markers YR00, E11, E13, E00, R20, G0000, W1, BG10, R11, G21, 0; StazOn Cotton White ink. Today, this all occasion handmade card is up on the Unity blog as part of my Watercolor Wednesday series there. For this card, I used distress oxide watercolor for the background and for the flowers. I made a video tutorial for the distress oxide background watercolor process. Here is another look at this card with watercolor background accents. Supplies: Unity Stamp Co. Stay Classy, Grow In Grace and Aurora Collection sequins; Ranger watercolor paper, distress oxide ink and archival ink; My Creative Time dies. 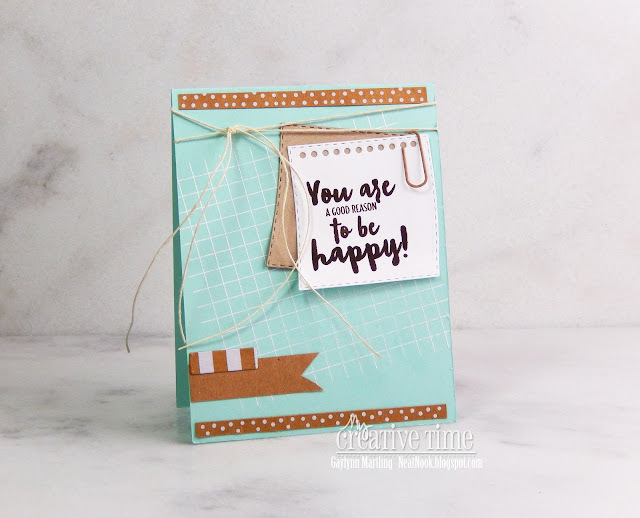 Hello, Gaylynn here with a happy encouragement handmade card for the My Creative Time Thoughtful Tuesday inspiration projects. Sentiment: You are a good reason to be happy! Here is a happy little note, made to look like sticky notes with a paperclip. The notes and the paperclip are die-cuts. The background and sentiment were stamped. I think this is great for encouragement, birthday or just because. It works for guys or gals. Be sure to stop by Miss Emma's My Creative Time blog for more Thoughtful Tuesday project inspiration. Hello, it's Gaylynn here. Today, we are celebrating MCT's 7th Birthday and 79th Edition release with a blog hop and sale. Also, it is Miss Emma's birthday. Please join me in wishing her and MCT a very HAPPY BIRTHDAY!!!! If you want to see the full lineup, it is on the My Creative Time blog. Sentiment: Dad, I thank my lucky stars for you! This is a card that is perfect for Dad's birthday or Father's Day. I wanted to use this circle border in black as part of this masculine card. Using complementing colors and circles for the background helped to get the look I wanted. The sentiments were heat embossed in white. I added a star and a gold trim to finish. Here is a look at today's release items. ***FREEBIE*** Starting on Friday, May 18, 2018 @ 8am PST we will be giving away an ADORABLE new “Baby Cake Die”. This die will be given to the FIRST 50 shoppers! If you are one of the 1st 50 shoppers it will automatically be added to your package at the time of packing/shipping. Once 50 shoppers came through, this stamp set will be available for purchase. So, if it's for sale in the store, you are not one of the 50. No exceptions will be made. This freebie is not part of the "bundle" and will be sold separately. 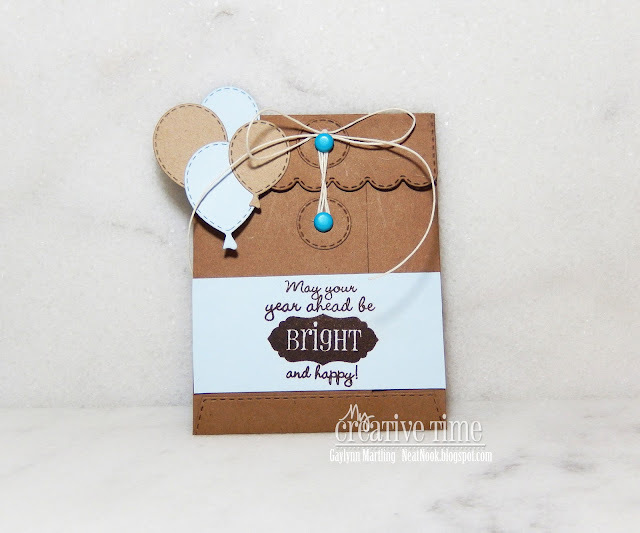 Baby Cake Die (FREEBIE) ***BLOG HOP GIVEAWAY*** For our blog hop giveaway, Emma is giving away a $25 gift card to the "My Creative Time" store to ONE LUCKY winner! ALL you have to do is leave a comment on each of our blogs! You are NOT required to comment on EVERY SINGLE blog, but the more you comment on, the MORE chances you have for winning! VERY IMPORTANT, PLEASE leave a way for us to contact you w/your comment just in case "YOU" are the lucky winner! ***SALE ALERT*** ALSO, DON'T FORGET our sale starts RIGHT NOW here! Use the code: MAY2018 to receive a discount off your entire purchase! This sale applies to "IN-STOCK" items ONLY. This sale will end on Friday, May 25, 2018 @midnight PST. Here are my sneak peek projects from this week. To see more about them, see Day 1, Day 2, Day 3 and Day 4 posts. Here is another look at today's Dad card. Your next stop in the blog hop is Miss Jessica's blog. The entire blog hop lineup is on the My Creative Time blog. Thanks so much for visiting. I look forward to your kind comments. Hi, Gaylynn here with day 4 of the My Creative Time sneak peeks for their 79th Edition release and 7th birthday celebration. Super Tag Dies This is a tiny cake die, that can be used for birthday or any celebration occasion. I decided to make a bright and festive gift tag to add to a bag, wine bottle, party favor or wrapped gift. ***FREEBIE*** Starting on Friday, May 18, 2018 @ 8am PST we will be giving away this ADORABLE new “Baby Cake Die”. This die will be given to the FIRST 50 shoppers! If you are one of the 1st 50 shoppers it will automatically be added to your package at the time of packing/shipping. Once 50 shoppers came through, this stamp set will be available for purchase. ***Sneak Peek giveaway! *** We will be giving away the sets we are showcasing each day to ONE lucky winner! For example, the set we are showcasing on Wednesday, Emma will announce the winner of that on Thursday & the sets we are showcasing on Thursday, Emma will announce that winner on Friday on my blog! ALL you have to do is leave a comment on each of our blogs! You are NOT required to comment on EVERY SINGLE blog, but the more you comment on, the more chances you have for winning! VERY IMPORTANT, PLEASE leave a way for us to contact you w/your comment just in case "YOU" are the lucky winner! For EXTRA entries, you can spread the word about this release on Facebook, tweet about it OR even instagram it! #mycreativetime! GOOD LUCK EVERYONE & let's start spreading the word! ;) Here is another look at today's gift tag featuring the freebie. Remember to visit Miss Emma's My Creative Time blog for more pretty sneak peeks of the upcoming release. Thank you for visiting. Stay tuned tomorrow (Friday) for the entire release reveal and blog hop. Today, this all occasion handmade card is up on the Unity blog as part of my Watercolor Wednesday series there. 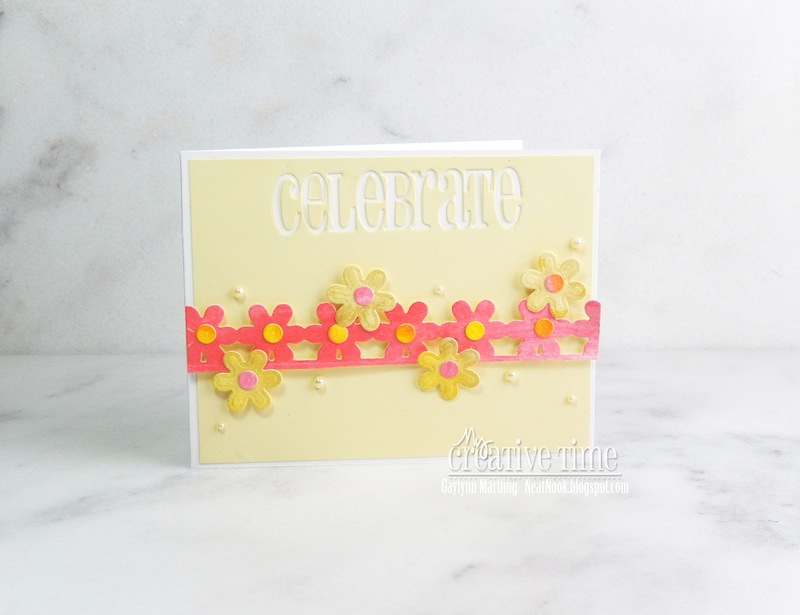 I am sharing an easy way to use Gelatos as watercolor for a vibrant stamped card background. I made a video tutorial for this Gelatos watercolor process. Here is another look at this Gelatos card. Supplies: Unity Stamp Co. Gratitude & Joy May 2018 SMAK, So Very Grateful and Cinderella sequins; Faber-Castell Gelatos, Ranger watercolor paper and archival ink; Dylusions ink spray, My Creative Time dies. To read the entire article and details for this Gelatos watercolor card, visit the Unity blog. 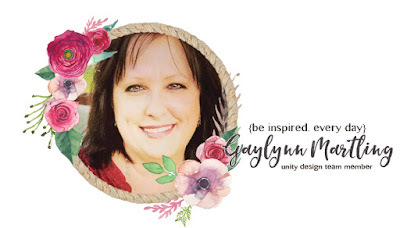 Hi, Gaylynn here with day 3 of the My Creative Time sneak peeks for their 79th Edition release and 7th birthday celebration. Hooray, it's your day! I forgive you for being younger than me! 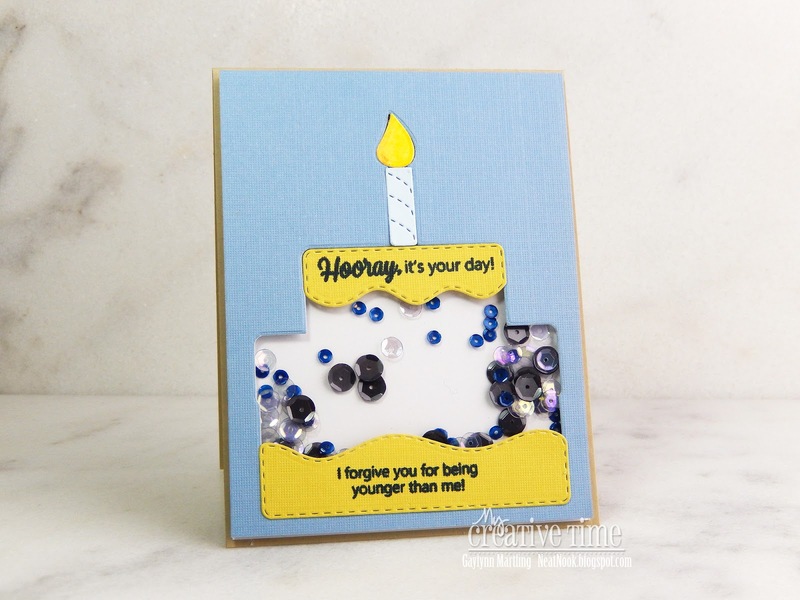 This birthday cake shaker card was made to be used as a masculine card. But it would certainly work for the gals too. I decided to use the big cake die to make a shaker window. Sequins were added along with clear cardstock. And then, I layered the other die-cuts on top to accent. My favorite part is the funny sentiment. There are FUN sentiment stamps in this release. It will be a go to set for me, for sure. ***Sneak Peek giveaway! *** We will be giving away the sets we are showcasing each day to ONE lucky winner! For example, the set we are showcasing on Wednesday, Emma will announce the winner of that on Thursday & the sets we are showcasing on Thursday, Emma will announce that winner on Friday on my blog! ALL you have to do is leave a comment on each of our blogs! You are NOT required to comment on EVERY SINGLE blog, but the more you comment on, the more chances you have for winning! VERY IMPORTANT, PLEASE leave a way for us to contact you w/your comment just in case "YOU" are the lucky winner! For EXTRA entries, you can spread the word about this release on Facebook, tweet about it OR even instagram it! #mycreativetime! GOOD LUCK EVERYONE & let's start spreading the word! ;) Here is another look at today's card. Remember to visit Miss Emma's My Creative Time blog for more sneak peeks of the upcoming release. Your comments are always appreciated. Stay tuned each day through Friday for more project inspiration using MCT. Hi, Gaylynn here with day 2 of the My Creative Time sneak peeks for their 79th Edition release and 7th birthday celebration. Kindness For this card, I die-cut a circle border trim and extra dots which were leftover from the cuts. All of the circle details were made from Gelatos watercolor. With a few adhesive pearls and a sentiment panel, this card is ready to go. Hi, Gaylynn here with day 1 of the My Creative Time sneak peeks for their 79th Edition release and 7th birthday celebration. Tag Die Layers For this card, I die-cut a flower trim and extra flowers from watercolor paper and Gelatos watercolor. I blended the gelatos on the paper and then added a little water to blend further. It gave the flowers a shimmer which doesn't show in the photo. Then, I die-cut the sentiment and added a few adhesive gems on ivory paper. Thanks for stopping by. Your comments mean the world to me. Amazing you handmade bird card. Here is an all occasion handmade card with a cute bird and sentiment. It is great for birthday, congratulations, love, friendship and more. Sentiment: There is only one amazing you. I used simple patterned paper layers to decorate the background. For the bird, I used light Copic coloring along with a stamped scalloped frame. 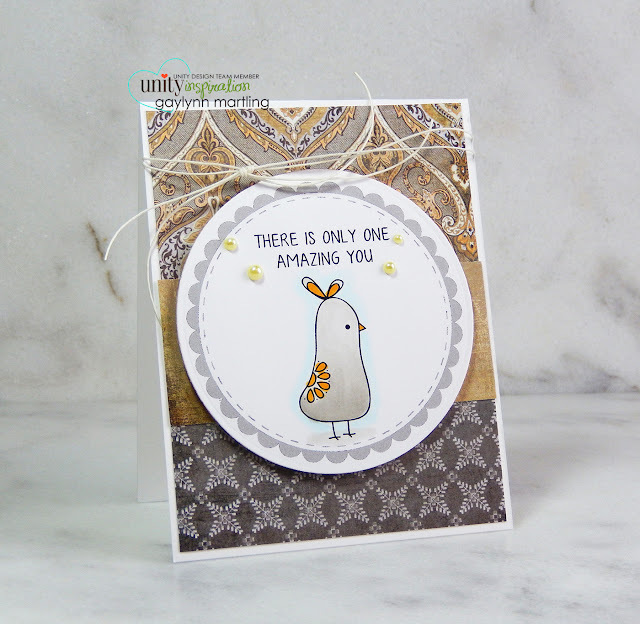 Here is a quick video tutorial on this sweet bird card. Supplies: Unity Stamp Co. I'm Obsessed Birdies and Scalloped Circle Border Stamps, Copic markers W1, YR24, W3, B0000; adhesive pearls, twine, Ranger in and BasicGrey paper. House warming handmade card and video. This handmade card is great for congratulating someone on their new home or for a house warming party. For this card, I created a spotlight on the house using distress ink and a simple circle mask. 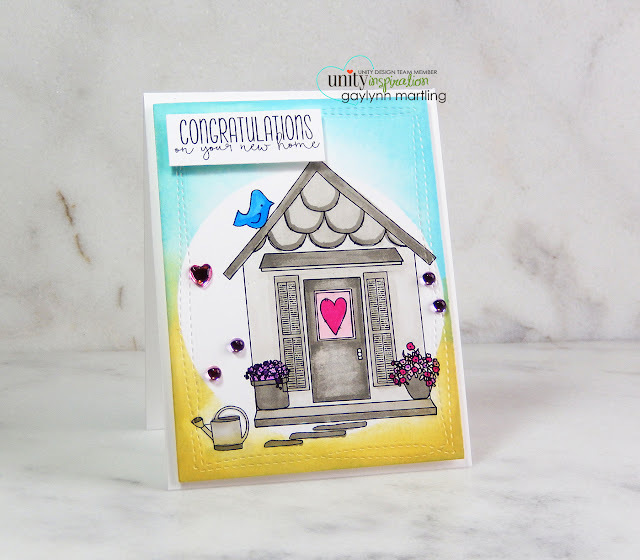 Here is a quick video tutorial on this simple and sweet house warming card. Supplies: Unity Stamp Co. With You I'm Home, Copic markers RV09, RV11, V09, V04, B14, B05, W1, W3, W5; Avery Elle and Spellbinders dies, repositionable tape, Ranger distress ink pads in tumbled glass and shabby shutters. Birthday balloons masculine gift card or money holder. 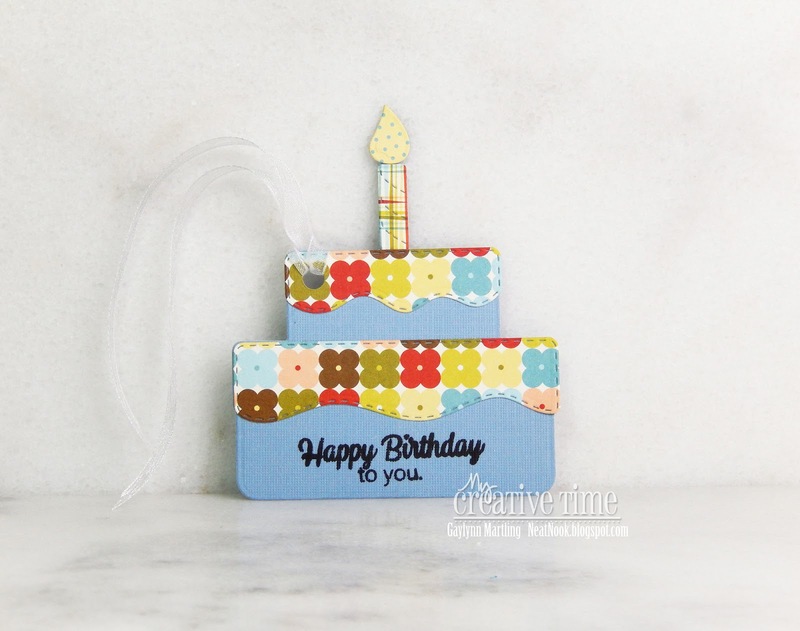 Hello, Gaylynn here with a gift card or money holder for the My Creative Time Birthday Palooza inspiration projects. Psst.... Today is Miss Emma's birthday. Join me in wishing her a Happy Birthday. Sentiment: May your year ahead be bright and happy! I needed another gift container for birthday cash. This small top fold envelope is perfect for gift cards, money or small notes. It is decorated with balloons, brads and a sentiment. It works for guys, gals or kids. Be sure to stop by Miss Emma's My Creative Time blog for more Birthday Palooza project inspiration. Today, this all occasion handmade card is up on the Unity blog as part of my Watercolor Wednesday series there. I am sharing an easy way to add a watercolor wash to a stamped card background. I made a video tutorial for this watercolor wash process. Supplies: Unity Stamp Co. I'm Obsessed Birdies, Obsessed With Floral and Scalloped Circle Border Stamps; Ranger watercolor paper, archival ink, mini mister and distress ink pads. ; My Creative Time dies. To read the entire article and details for this watercolor wash card, visit the Unity blog. Good morning. It's Gaylynn here with a My Creative Time 48 hour flash sale, release and blog hop. If you want to start the hop from the beginning, the entire lineup is on the My Creative Time blog. 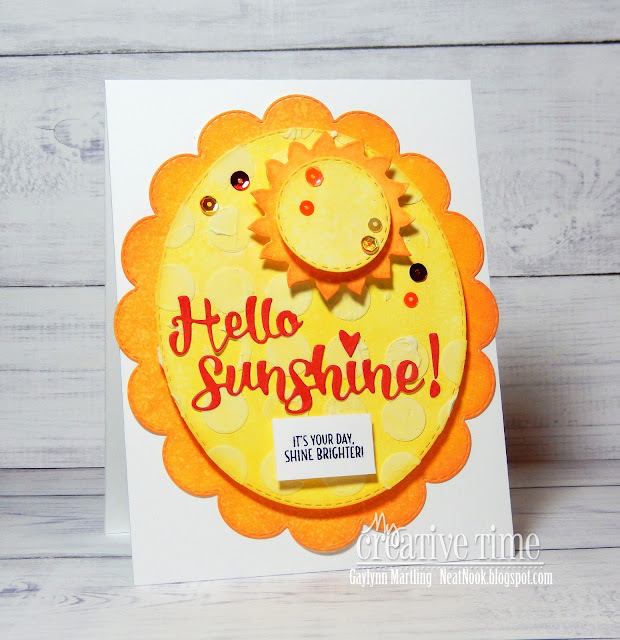 Sentiment: Hello Sunshine! It's your day. Shine brighter! Welcome to another "48 Hour Flash Sale!" This sale is for 48 hours ONLY that is going on right NOW and will end on Sunday, May 6, 2018 @ 7pm PST. We are showcasing an AMAZING new KIT! It is called "A Sunny Hello". This exclusive and limited kit is available now for purchase, until it sells out! Don't forget to use the code FLASH at checkout to get 20% off of your entire "in-stock" only purchase! Sale applies to in-stock items only! For today's card, I used Ranger distress oxide ink pads to cover the layers. They ink colors are fossilized amber and spiced marmalade. Then, I added modeling paste with the included dotted stencil. Once it all dried, I spritzed it all with water. Everything was layered for a happy and sunny greeting card. Come hop along with us for LOTS of inspiration using this brand new exclusive and limited KIT! Your next stop in the hop is Miss Jessica's blog. If you get lost along the way, the entire blog hop lineup is on Miss Emma's My Creative Time blog. Thanks so much for visiting. Your comments mean the world to me. Have a lovely Spring day. Camera floral encouragement handmade card. 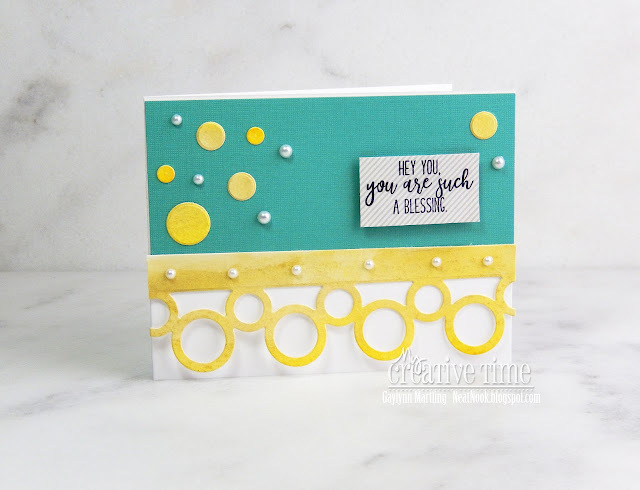 Gold shimmer watercolor birthday card accents.